A quiet earthquake hit the medical field on October 1st, 2015 when the Centers for Medicare and Medicaid Services officially implemented a new set of diagnostic and procedural codes for health care providers to use in reporting and billing. This is called the ICD (International Classification of Diseases) 10. It replaces the ICD 9, which has been used in the United States since 1979. 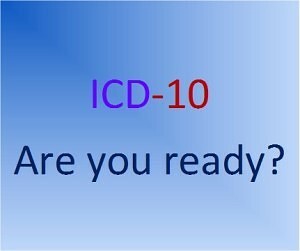 The ICD 10 features an enormous expansion of the details that need to be documented in the codes for billing, compared to the ICD 9. For example, the number of codes rose from 14,000 diagnosis codes to 68,000. Included in this are thousands of new procedure codes, up from 4,000 inpatient procedure codes to 87,000. That’s almost a whopping 5 times the number of diagnostic codes and 22 times the number of new procedure codes. These refinements in codes must all be supported by documentation in the medical notes written by doctors, nurses, and therapists. The chances of making a mistake about the correct diagnosis are now also enormously greater. More details required in documenting each patient encounter translates to additional time spent on charting by each provider. This runs smack up against the ever-increasing burden of time constraints placed on healthcare providers to complete an evaluation and implement a treatment plan for each patient. Tie that to errors that can be easily missed when it comes to communicating this information, and it’s not hard to see how the new expansion of details regarding diagnosis codes and procedures could lead to medical mistakes. Many of the concerns have been focused on payment issues for the health care providers. Medicare has stated that it will give health care providers, at least, one year to get all the codes right, and will still pay for services as long as the code is in the right category. Private insurance companies are expected to follow suit, but there is no mandate for them to do so. A far more concerning problem is how this could result in devastating damages for patients. What happens when the incorrect diagnosis leads to other mistakes in the patients care or is part of a medical error that leads to death, disability or other serious injuries? How will that be handled several years down the road, and who will take responsibility? It has been jokingly said that letting lawyers make laws is like letting doctors make diseases. Ironically, this seems to be exactly what is happening now. Medical coding is increasingly being used as a means of communicating information about medical care. If the code used does not fit the situation, the patient could not only receive the wrong care but could also have to deal with the long-term consequences of having been given the wrong diagnosis. Some of the areas of health care most affected are emergency rooms and urgent care centers, because the new coding system requires much more documentation for injuries. That information may be difficult to get right, and will certainly take much more time to document. Emergency and urgent care facilities can be extremely busy. With all the attention shifted to the coding detail for payment purposes, it is easy to see how the distraction could lead to errors. Problems with coding will mean denials for coverage of treatment, and could lead to delays in therapy or referrals to specialists. This could result in potentially irreversible consequences for patients. In a recent study under the direction of Andrew Boyd at the University of Chicago, researchers looked at over 24,000 actual encounters in the ER. They found that using the ICD 10 guidelines, 23 percent of the patients may have been assigned incorrect codes, leading to problems justifying hospital admissions and reporting diseases to public health authorities. Pharmacy coverage also relies heavily on diagnostic codes to match the diagnosis to an approved formulary (the hospital’s official list of medicines that may be prescribed) for treatment. A small error in coding could easily result in a lack of coverage and a delay in treatment for patients. Med League provides expert witnesses in billing and coding who can untangle these nightmares for your clients. Contact us for help. We’re delighted to assist you.